March 5, 2012 Update: Huzzah! Upgrades to the ThoughtOffice update server have now been completed. No more pesky “404” error, ThoughtOffice fans! Android version (for you folks who hide your phone under the boardroom table and take a peak as you fire off your brilliant questions – all from the Topic Module, live, in the depth of your meeting. Cloud version. We have a fully browser-enabled version (v2.0) coming along as well. It’s cool in that you can access it anywhere you have web service. Thoughts? Ideas? Insights? Lay ’em on us. We’re always open for your insights. And thanks for working with us as we expand our technology to better rock your creative world. Dave, Mark, Chipp, Chris, Eric and team. Keep an eye on this page for all the latest, or follow our Twitter feed for updates. Feel free to watch this page for all the latest news, or follow our Twitter feed for updates. September 12, 2011 Update: We’ve updated the Lyrics Tab for a bit. It’s not pulling multiple pages of results yet, but it’s a solid start. And it’s pretty responsive to your search term. So yeah! Now we’re integrating the new Image Tab and some additional secret sauce. We’ll keep you posted. Thanks for your patience. We hope to have an ETA soon for resolving the errors with the “Lyrics” tab. Until then, please keep an eye on this page for all the latest, or follow our Twitter feed for updates. And by all means, e-mail us right away at info@thoughtoffice.com if you ever have an issue with ThoughtOffice that is not explained on this page, or our Support or FAQ pages, and we’ll be happy to do all we can to resolve the problem. March 03, 2011 Update: Today, ThoughtOffice users were reporting that three more tabs in the IdeaBrowser were showing error messages. The “Definitions”, “Synonyms” and “Hypernyms” tabs were not functioning properly. This was in addition to the ongoing issues with the “Lyrics” and “Quotes” tabs in the IdeaBrowser. (Noted in the February 22nd entry, below.) The problem with the “Definitions”, “Synonyms” and “Hypernyms” tabs has been resolved, but we still don’t have an ETA for resolving the errors with the “Lyrics” and “Quotes” tabs. Please keep an eye on this page for future updates, or follow our Twitter feed for all the latest. And feel free to e-mail us right away at info@thoughtoffice.com if you are ever using ThoughtOffice, and have an issue that is not explained on this page, or our Support or FAQ pages, and we’ll be delighted to do all we can to resolve the issue. February 22, 2011 Update: We are now seeing some transient errors on the ThoughtOffice “Quotes” tab in the IdeaBrowser. When users search on a word in the IdeaBrowser “Quotes” tab, no results are returned. We’re also still working to resolve the error message on the “Lyrics” tab in the IdeaBrowser. More details about the “Lyrics” tab issue are in the January 6th entry, below. We still don’t have an ETA for resolving either error. Please keep an eye on this page or follow our Twitter feed for updates. If you are ever using ThoughtOffice, and have an issue that is not explained on this updates page, on our Support page, or in the ThoughtOffice FAQ, by all means e-mail us right away at info@thoughtoffice.com and we’ll be happy to do everything necessary to resolve the issue. January 6, 2011 Update: ThoughtOffice users are currently experiencing an error message when clicking the “Lyrics” tab in the IdeaBrowser. The error message, “An internet connection is necessary for this feature and one could not be detected!” seems to be caused by a server timeout at one of our database partners. It appears to be very much like the issue we noted from August 4 to August 31, 2009. We don’t currently have an ETA for resolving the error. Please keep an eye on this page or check our Twitter feed for updates. Whenever you are using ThoughtOffice, and see unexpected error messages that are not explained on this page, or our Support or FAQ pages, please feel free to e-mail us right away at info@thoughtoffice.com and we’ll be happy to answer your questions or resolve the issue. December 22, 2010 Update: Visitors to the ThoughtRod.com web site today were exposed to a cross-scripting exploit, which may have taken them to sites advertising adult material or bogus anti-virus software. The problem resulted from a back-door attack on ThoughtRod.com’s hosting service. The good news – ThoughtRod.com has now been disinfected, and is back to its old self again. More good news – no customer information was exposed to the hackers at any time. Your privacy remains safe. We apologize to anyone who was exposed to the exploit, and can recommend MalwareBytes Free Anti-Spyware to all our friends who are running Windows. We’ve found the program to be effective and a great way to clean up any malicious software on your PC. Please keep an eye on this page or follow our Twitter feed for future updates about ThoughtOffice. And if you are ever using ThoughtOffice, and have an issue that is not explained on this updates page, on our Support page, or in the ThoughtOffice FAQ, by all means e-mail us right away at info@thoughtoffice.com and we’ll be happy to do everything necessary to resolve the issue. August 9, 2010 Update: A maintenance glitch over the weekend temporarily disabled many of the pages on ThoughtRod.com. The issue has now been resolved, and the site is back at 100%. Please follow our Twitter feed or keep an eye on this page for future updates about ThoughtOffice. And if you are ever using ThoughtOffice, and have an issue that is not explained in the ThoughtOffice FAQ, or on this updates page, or our Support page, feel free to e-mail us right away at info@thoughtoffice.com and we’ll be happy to do everything possible to correct the issue. November 12, 2009 Update: We’re happy to report that the ThoughtOffice server update is complete, in record time (thanks, Chipp! ), and users should now be able to use all the program’s features. November 11, 2009 Update: Today, ThoughtOffice has been upgrading its servers, resulting in some error messages for ThoughtOffice users. The upshot is this – it’s not currently possible to run the program online. The IdeaBrowser is not accessible, but the Session Composer and Topics Browser features still work fine in “offline” mode. Just close any “Socket Timeout” windows that appear, and you should be able to work offline. There are also issues downloading the demo program, and installing it successfully. We expect the issue to be resolved by early evening, Wednesday the 11th, Pacific time. We apologize for the inconvenience. For future updates, please keep an eye on this page or follow our Twitter feed. If you are ever using ThoughtOffice, and have an issue that is not explained on this page, or our Support or FAQ pages, please feel free to e-mail us right away at info@thoughtoffice.com and we’ll be happy to do all we can to resolve the issue. October 20, 2009 4 PM Update: The ThoughtOffice license server is being updated today. This will result in delays creating registration keys for new purchasers of ThoughtOffice software. We are terribly sorry for the inconvenience to our new users. The server updates should be completed very soon. In the meantime, the program is fully functional in demo mode for up to 15 days. And we should have the upgrades done long before then. To keep up to date on issues relating to ThoughtOffice Innovation Software, please follow our Twitter feed, or bookmark and refer to this page. And by all means, please feel free to e-mail us right away at info@thoughtoffice.com if you ever spot an issue with ThoughtOffice that is not covered on this page, or our FAQ or Support pages, and we’ll be happy to help correct the issue as quickly as possible. September 29, 2009 8 PM Update: The ThoughtOffice server upgrade is now complete. We are terribly sorry for the inconvenience to our users. As sometimes happens, IT jobs can be more involved than they initially appear, And that’s what happened in this case. We’re taking steps to ensure that future updates are completed far more quickly. For future updates, please follow our feed on Twitter, or bookmark and refer to this page. Please feel free to e-mail us right away at info@thoughtoffice.com if you ever encounter an issue with ThoughtOffice that is not covered on this page, or our Support or FAQ pages, and we’ll be happy to help resolve the issue as quickly as possible. September 29, 2009 Update: ThoughtOffice is continuing the process of upgrading its servers today. This is causing error messages for some ThoughtOffice users. This is a continuation of the upgrade described on September 27th, and is similar to the errors that were reported on June 17th. We expect the issue to be resolved by this afternoon, Tuesday the 29th, Pacific time. Again, we apologize for the inconvenience. September 27, 2009 Update: Today, ThoughtOffice has been upgrading its servers, resulting in some error messages for ThoughtOffice users. The upshot is this – the IdeaBrowser is not currently available, and the program is incorrectly reporting that users need to register the program. We expect the issue to be resolved by early afternoon, Monday the 28th, Pacific time. We apologize for the inconvenience. August 31, 2009 Update: The ThoughtOffice Lyrics tab (in the IdeaBrowser) is back online, and faster than ever. August 12, 2009 Update: We are receiving reports from ThoughtOffice users that they are getting socket errors when launching the program. This is the same issue we encountered in June, and full work-around details can be found in our entries for June 1st and June 17th. 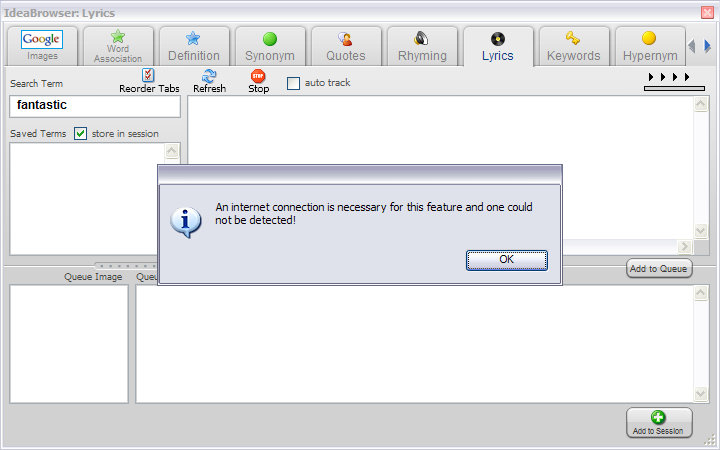 ThoughtOffice users are also still seeing error messages when using the Lyrics tab in the IdeaBrowser. The issue seems to reside with one of our database partners, and is taking longer to resolve than anticipated. Please keep an eye on this page or check our Twitter feed for updates. August 4, 2009 Update: ThoughtOffice users are reporting error messages when using the Lyrics tab in the IdeaBrowser. This seems to be related to a server timeout issue with our database partner for Lyrics searches. The problem is likely to be resolved within 24 hours. Any time you experience performance issues with ThoughtOffice, please feel free to e-mail us right away at info@thoughtoffice.com and we’ll be happy to help resolve the issue, or answer any of your questions. June 18, 2009 Update: To update the June 17th entry immediately below, as of 2 AM PDT June 18th, all ThoughtOffice servers are back at 100% capacity, and ThoughtOffice users should now be able to run the program without seeing any error messages. If you are still experiencing performance issues with ThoughtOffice, please feel free to e-mail us right away at info@thoughtoffice.com and we’ll be happy to get you back to peak performance, or answer any questions you may have. June 17, 2009 Update: ThoughtOffice users are experiencing some connection errors as our development team continues to optimize our servers in Austin, TX. As a result, users are seeing error messages such as “Cannot connect to Application Server” and “Cannot connect with update server”. If users click the “OK” button on the first error dialog, and on the following dialog, click “Launch eXs”, then ThoughtOffice should start and run correctly. The only functions that will be impaired are the IdeaBrowser tabs for Definition, Synonym, and Hypernym. These tabs will come back online shortly. There is a brief video in our June 1 entry, directly below, that can offer more insight. If you need more information, please feel free to e-mail us at info@thoughtoffice.com and we’ll be happy to answer your questions. If you’ve read everything here, and on our Support and FAQ pages, but you’re still not sure what the heck is going on with ThoughtOffice? Well, e-mail us right away at info@thoughtoffice.com and we’ll do everything humanly possible to get the issue resolved for you.